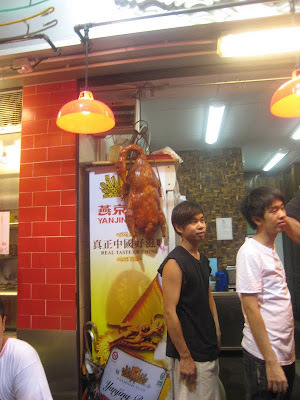 A Kindle in Hong Kong: Mid-Autumn Festival and GIVEAWAY WINNER! This week we celebrated the Mid-Autumn Moon Festival in Hong Kong. In place of a regular walking tour, I'm going to share some of my pictures and videos from the Tai Hang fire dragon dance and the lantern festival in Victoria Park. In other news, Mid-Autumn Festival also marks the end of my 100 Follower Giveaway. Random.org generated the number 9, so the winner of a $15 gift certificate to Amazon.com is the 9th commentator: Kaela Chow!! Kaela, I'll be emailing you the code for your gift certificate. Thanks for being such a faithful follower of this blog since the very beginning. I joined the crowds gathering in Tai Hang for the fire dragon dance. This celebration has been going on for well over 100 years. 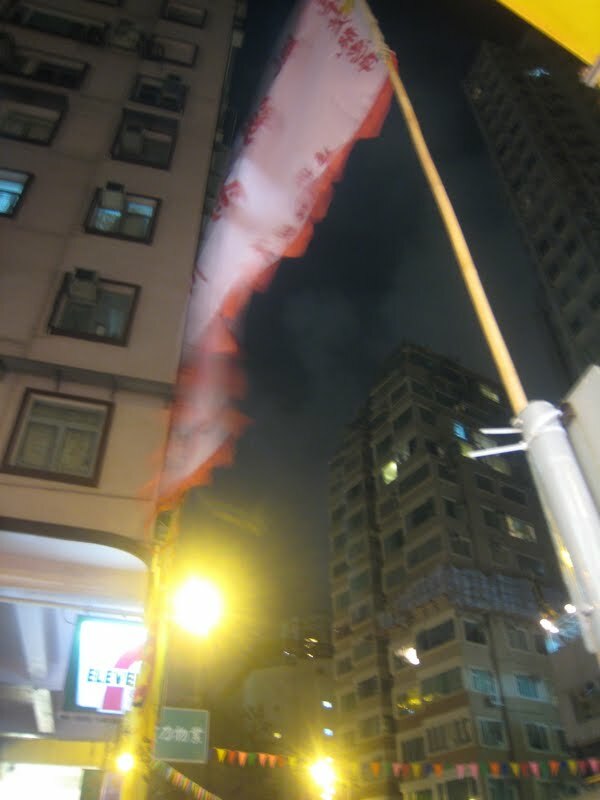 Tai Hang was a little village troubled by evil spirits. Now it's populated by high-rises just like every other neighborhood in HK. The dragon came to scare the spirits away from the village. Now it continues to dance in the streets, attracting tourists and locals once a year. I caught sight of the volunteers preparing the fire dragon in a back street, filling its body with sticks of burning incense. The fire dragon was about 220 feet long, and this was only a small section. I went back to the main street, where stalls were selling lanterns, both traditional and battery operated. Groups of teenagers lined the main street, holding lanterns. These lanterns were lit by real candles. Does anyone know what this character means? When the volunteers lifted the lanterns into the air and the drums started pounding, we knew the fire dragon was on its way. Before we knew it, the dragon disappeared down the street again. While we waited for it to return, we were surprised to hear the sound of bagpipes. Apparently you can't have a parade anywhere in the world without a few kilted pipers. This was very exciting for the spectators, and the air was filled with children on their parents' shoulders. 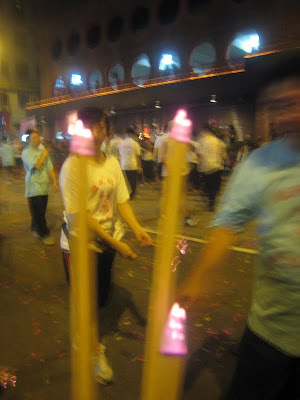 When the incense burned low, the men pulled it off the dragon and passed the sticks into the crowd. I got a few souvenirs. So I gave him a few of my extras. Then the dragon returned, newly lit, for one more dance through the streets. As I left Tai Hang, I noticed the lanterns hanging from the eaves of several buildings. Along with signs of normal life. Next, I walked over to Victoria Park, past the Central Library. There was a huge lantern festival in the park. I saw people everywhere. 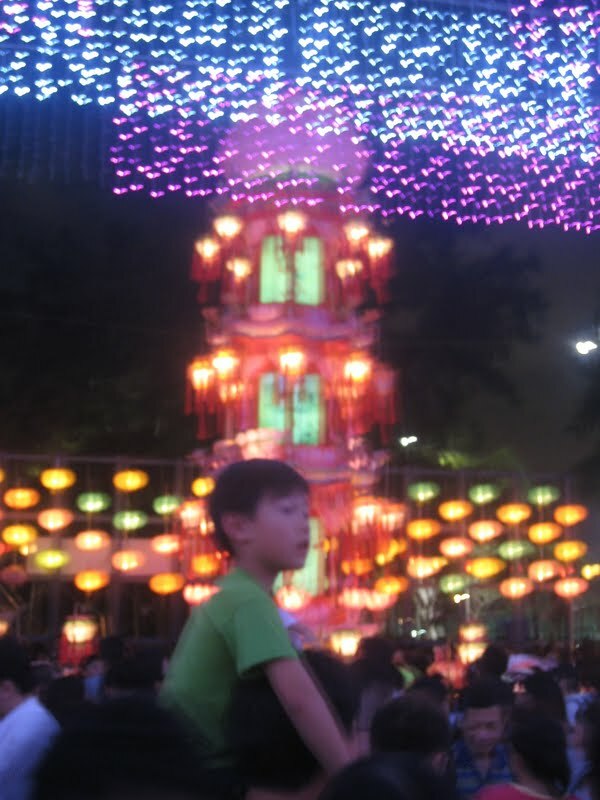 The children carried intricate lanterns through the crowd, though sadly I couldn't capture them properly in the dark. There were bigger lanterns set up too. The biggest of all is supposed to break the Guinness World Record this year. It sat beneath the mid-Autumn moon. Finally, I fought my through the crowds and left Victoria Park and the Mid-Autumn Festival behind. Thanks for stopping by for a little piece of the festivities. I hope the videos gave you an idea of the noise and atmosphere of these events. Come back next week for a new Hong Kong walking tour! That's so cool! We have 3 international Chinese students at my school this year so we went to the Chinese embassy and listened to erhu music, karaoke, and ate the first really good Chinese food I've had in Jordan. Hopefully I get to visit Hong Kong in the winter, then you can show me some of your Walking Tours in person! Great festival chronicle - looks crazy, but fun. On another note, I'm the editor of ExpatArrivals.com, and I came across your blog through the course of my research for Hong Kong. At the moment we're in the midst of updating and improving our current guide, and we're looking for expats living in the city to help us write/revise/amend some of our content. We're also looking for expats to share their insight about their own unique experience by completing a basic email questionnaire. Though we can't financially compensate for either task, we do provide promotional profile space on our site that you can use to levy exposure for yourself, your blog and your business. Any chance you'd be interested? Thanks for your comments everyone! Kaela, I think you would have a fantastic time in HK. Joyce, I think you would have enjoyed the festival. Hopefully you'll be able to see the Chinese New Year festivities in a few months. Stephanie, I sent you an email. Thank you for getting in touch. For general reference, my email address is listed on my contacts page (see the tab at the top of this page). It looks like a nice event. I like that kind of parades. Specially at night with a lot of food and drinks that you don't know what to do because there are many things to do.